Last night at the Allstate Arena in the Chicago suburb of Rosemont, IL, living legend Erik Morales tried to become the first Mexican fighter to win major world titles in four weight divisions but despite a strong performance, was denied the honor by WBC Lightweight Champ David Diaz. 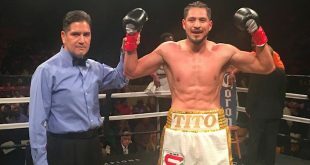 Reigning WBC Lightweight Champion David Diaz started the bout strong, swarming all over the former super bantam, feather and super feather from Tijuana. Diaz has spent most of his career at light welter and was clearly trying to impose his strength advantage on the taller Morales. It looked bad for Morales in the very first round, taking a lot of body punishment before getting nailed by a heavy Diaz right hand. Morales was shaken but it woke him up as he responded with a perfect right of his own that put Diaz down on the canvas. The local man beat the count and the first came to a close. Diaz was more respectful of Morales in the second and the third saw the Mexican legend open up with both hands, producing firefights that Morales largely won and Diaz was shaken by a few hard shots. Morales looks to have regained his classic form in the fourth and is clearly leading the fight although Diaz begins to regroup somewhat in the fifth. 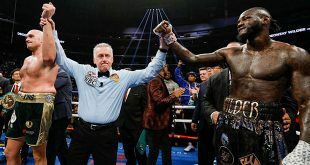 The effort expended in the last three rounds has tired Morales and Diaz takes the initiative in the sixth, bulling his rival around the ring and landing a few big shots among the many that miss the mark. 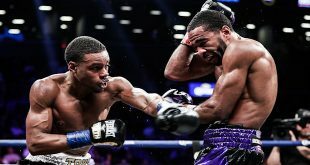 Diaz continues to regain lost ground in the seventh and eighth, pressuring a badly worn down Morales with a good work rate and bunches of punches, but the Chicago man's right eye has become swollen from the beating applied by Morales in the early rounds. Morales has rested enough in the last two rounds that he can begin to reapply himself in the ninth and catches the oncoming Diaz with a good number of shots from both hands. It's a dogfight in the tenth as both men go at it tooth and nail with no clear winner of the round before Morales asserts himself for most of the eleventh but is caught by some hard, eye catching shots by Diaz during the closing moments. The last round sees Diaz the fresher of the two and the champion puts everything he has into trying for the knockout and Morales has to draw on his long big fight experience to get through to the final bell. When the judge's scores are read, Diaz takes a unanimous decision victory 115-112, 115-113 and 114-113. Erik Morales falls to 48-6 (34) and announces his retirement immediately after the fight. David Diaz retains his WBC 135 lb title and improves to 33-1-1 (17).